The RIAS Kammerchor (RIAS Chamber Choir) has an artistic profile which is unmistakeable in its rich diversity and is received with enthusiasm all over the world. Among professional choirs, the RIAS Kammerchor is a pioneer in the area of historical performance practice. Since its foundation, it has also been exemplary in promoting music of the modern era and the present day. Within the context of the tension between these areas, the choir’s interpretations of works from the classical and romantic repertoires have acquired intensive musical speech with clarity of depth. The choir has grown decisively above all in the breadth of its range of stylistic expression under the direction of Hans-Christoph Rademann, who has been chief conductor since 2007. He has been able to build on the foundation provided by the work of his predecessors in this area. A clear departure from the monumental style of Bach interpretation was already evident in Karl Ristenpart’s project to record all the Bach cantatas, a project which unfortunately remained uncompleted. “Transparency as in chamber music” was Ristenpart’s guiding principle. When Uwe Gronostay took over the choir in 1972, he continued to mould its sound with the ideal of a chamber choir in mind, giving it homogenous form with assured intonation and stylistic flexibility. He looked to partners in Europe such as Eric Ericson and his chamber choir for this new direction, introducing fundamental principles of historical performance practice into the choir’s work. These were systematically developed by Marcus Creed, who succeeded in creating firm partnerships with specialised orchestras such as Concerto Köln, Freiburger Barockorchester, Akademie für Alte Musik, Orchestre des Champs-Élysées, also establishing an exclusive link for the choir with the harmonia mundi france label in 1995. Numerous works of new music have not only had their premieres and first performances thanks to the RIAS Kammerchor, but have also been successively anchored in its repertoire and recorded in definitive interpretations. This aspect of the choir’s repertoire runs like a thread through its history. The fact that choir music is re-emerging today in a wide variety of styles is also to the credit of the RIAS Kammerchor and its constant commitment to new developments in music. The RIAS Kammerchor was founded by RIAS (Radio in the American Sector) in Berlin on 15 October 1948. Recordings for the broadcasting station’s needs determined the choir’s work during its first 25 years under Karl Ristenpart, Herbert Froitzheim and Günther Arndt. With the increasing availability of recorded audio media, the importance of public concerts and guest performances grew. Uwe Gronostay (1972–1986), who was elected honorary conductor by the choir in 2007, was responsible for this new orientation – he set up an individual series of concerts for the choir. His successor Marcus Creed (1987– 2001) raised the choir’s profile within the tension of the interplay between old and new music. Under his direction, the choir’s international popularity increased as did requests for performances. Daniel Reuss (2003–2006) shifted the focus to classical modernism and strengthened the choir’s links with partners both at home and abroad. Since 2007, Hans-Christoph Rademann has been creating new emphases in the development of the choir’s sound and repertoire. In December 2010, the British magazine Gramophone chose the RIAS Kammerchor as one of the top ten choirs in the world. 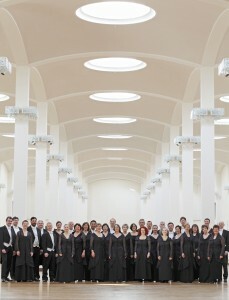 The RIAS Kammerchor is an ensemble of Rundfunk Orchester und Chöre GmbH (roc berlin.) The shareholders are Deutschlandradio, the Federal Republic of Germany, the State of Berlin und the Rundfunk Berlin-Brandenburg broadcasting station.